Having a personal diary is a worth habit . Though we find it difficult to mange writing daily stuffs , after several years or in a needy situation ,we will understand the use of having a diary . People usually write these daily notes in a specially prepared notebooks or in modern world they use blogs .And both these have some disadvantages . 1-abc.net Personal diary 2.01 is a digital diary software for Windows which can be used create unlimited password protected diary entries . So we will get privacy ,complete reduction in yearly purchase cost , protection from misuse/damages etc . Actual price of 1-abc.net Personal diary is 15 $ , but here you can get this software completely free . Diary entries can be protected with password . How get 1-abc.net Personal diary 2.01 full version serial . Go to this promotion page and sign up with your email . First you will get a verification email and then another email with full version serial . 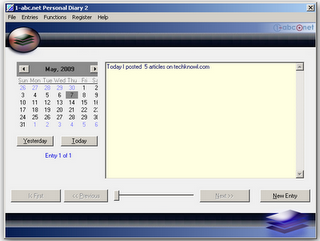 Download 1-abc.net Personal diary 2.01 ,free personal diary software Windows .